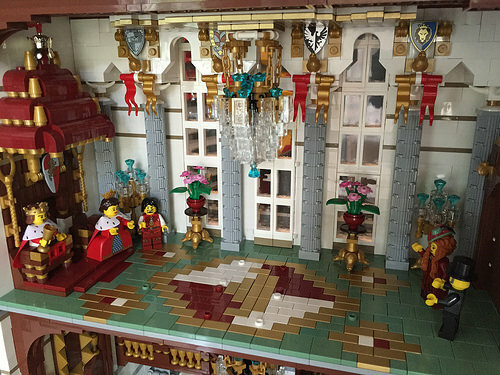 Royal palaces are normally buildings with amazing architecture, plush interiors and rich decoration, and this LEGO palace is no different. 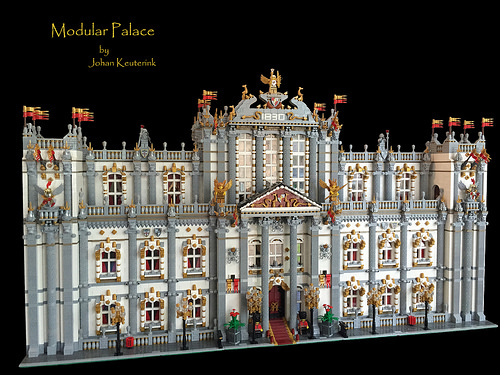 Built by Johan Keuterink, this huge modular palace has a few similarities to Buckingham Palace, not just in its Neoclassical architecture style, but also the two Royal Guards that the Queen has lent to protect the entrance! Although the Baroque details will not be to everyone’s taste, the aim is to impress visiting heads of state, and Johan’s palace should certainly achieve such an aim. I love intricate exterior street lights and the front door with some suitably impressive gold handles. Johan has taken the time to ensure that his palace has a lavishly decorated interior — Donatella Versace would feel at home in this house! The throne room is an example of the extensive details inside the palace with vast chandelier, patterned floor, and more gold than Fort Knox.